What do Argentina’s Lionel Messi and Diego Maradona and Brazil’s Pele have in common besides being international superstars and most likely in the Top 10 list of all-time soccer greats? They are all short. I hate it when I hear coaches place so much emphasis on size and height. Emphasis on speed I can understand. I also think height is important for a goalie. But to dismiss or overlook a player because of his/her physical stature is a huge mistake. Size does not matter! Shorter players have a lower center of gravity, making it much easier to dribble, make fakes and feints, and change direction. Never underestimate the toughness of a short player. These players are usually tougher and more physical than taller players. Before the age of 14 or 15, headers play a very insignificant part in a soccer game. Being able to out-jump someone for a header is of little value. Regarding headers; height does help; no doubt about it. But so, too, do timing and jumping ability. Check out these amazing headers by the aforementioned superstars. Messi’s 2009 UEFA Championship goal against Manchester City. Look how Messi reached back to head the ball. Maradona’s ‘Hand-of-God’ goal in the 1986 World Cup against England. 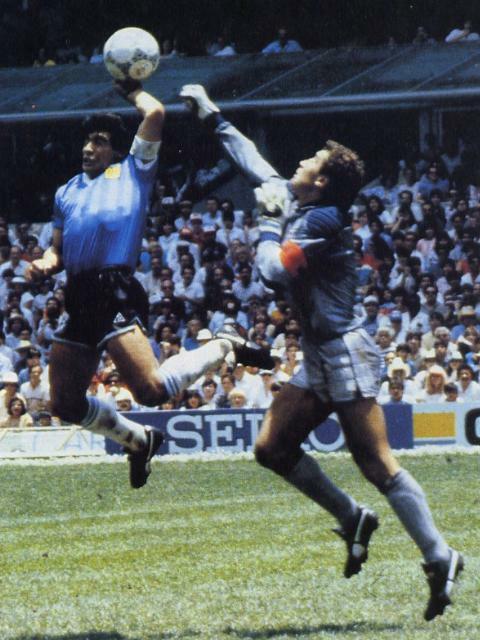 Though Maradona used his hand to score the goal (see images below), I’m still amazed when I look at the video. In real-time, it still looks like a legitimate header. Though it should not have counted, Maradona still had to get off the ground a good distance (the second picture shows how short Maradona is). Pele’s goal in the 1970 World Cup Final against Italy. Look how high he got. Remember coaches, just because soccer is called football throughout the world except in the United States, don’t place the same importance on size and height that American football coaches do. Otherwise, you may be overlooking the next Messi, or in my case, the next me. 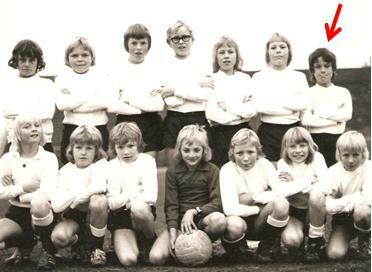 Photo of the 1975 or 1976 Odd Grenland Ballklubb youth team. I was 9 or 10 at the time. Would I (red arrow) have been overlooked by many coaches today?